March 10th through the 16th. 7 pm All Ages Each Night Plus Vendors! Sponsored by: Texas Public Radio, White Elephant Coffee Company, SATX Music, EEVET Escrow Vetting, The Down Market, and Oasis Snack Delights. Silent Sentinel, North American Pharaoh's, and more! Something4Someone is celebrating the Release of their first EP and Stephen Moring 's 22nd Birthday. The Palm Trees, St. Dukes (Acoustic Set), Michelle Angelique and more! MysterE, Justin Roberts Is A Simulation, and more! Imagine Books and Records hosts a night of live music with Damien Jay and his friends on Friday Feb. 8th at 8 pm $5 Cover All Ages. Dante Elephante is an alternative jangle pop band from Santa Barbara, CA. Released their first EP in 2013 and first full length "Anglo-Saxon Summer" produced by Jonathan Rado in 2015 via Lolipop Records. Following up with "Rare Attractions" released digitally in 2018 via Last Resort Forever. Coming to Imagine Books and Records Thursday Feb 7th. More information will be released closer to the date. Mark your calendars! Small Business, Middleground, Dylan Alley and more! Join us for an amazing evening of good ol jamz !!! Wow! We can not believe it has been another year! The year has gone by so fast. Thank you all for your support over these past seven years. We would not be here if it was not for all of you! Thank you so much! In honor of the seven years we will be hosting a weekend of great live music with some fantastic locals. Friday Oct 19th through Sunday Oct 21st. 8 pm $5 cover All Ages each night. More information to come! Cover Photo is from our grand opening! Want to be a vendor? Just message us! Joshua Myles EP Release Show! Join us at Imagine Books and Records for the Joshua Myles EP Release, "Secret Magic Underwear" on Friday Sept 28th at 8 pm! $5 Cover All Ages! Join us for an exclusive reading and signing of "lemon acuarelas", a work by survivor, advocate, poet and community partner, Cheyenne Raine @rainepoetry. A supporter of RCC and the movement, Raine has been partnering with us to raise awareness about sexual violence and inspiring others in their healing journeys. In her new book, Raine explores themes of culture, faith, love and more in a bilingual collection of poetry. We'll be joining Raine for this intimate event with all the RCC resources and swag. Note from the author: you can pre-order your copy of "lemon acuarelas" (dropped today!) and bring to the event for official signing. Get your copy today at rainepoetry.com/lemon-acuarelas. Tell all your folks, share all the info, and we'll see you in two weeks! Join us at The Loudest Bookstore in Texas for a great event of good vibes with touring musicians, Ariel & The Culture from Denton. Saturday Sept 22nd at 8 pm $5 cover all ages. 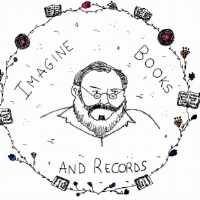 Spud Cannon is coming to Imagine Books and Records, Monday Aug 20th! Mark your calendars! Girl Fry is a latin Fringe punk band found in the greater Los Angeles and the southern parts of the California desert. Performing with them for local support is Lloronas. Junkyard Fort is releasing a bundle of joy for your ears! Join us at Imagine Books and Records for their Album Release Party Thursday July 26th at 8 pm with Special Guest: Optic Arrest, and Lloronas! Don't miss this super fun show! All ages! Chavela, Dreamplace, Calendar Days, and more! The Rock & Hip-Hop Summer Top Off: The Melt Down comes to Imagine Books and Records Friday July 20th! Live music and vendors! 8 pm $5 Cover All Ages! Swisher, Cliffside of The Pinkeyed Sky and more! Nemo & Kass, Empty Orchestras, Time Enders, REE and more! OTONANA TRIO return to the U.S. for to visit their beloved fans & play their signature party-funk dance tunes they are known and loved for. Come see Kentaro, Kaz and Hikari, and support their new album! Plus Art Vendors and more available! Imagine Books and Records hosts a great night of new indie rock bands at the loudest bookstore in Texas! Make sure to come out and support, Saturday June 23rd at 8 pm $5 Cover All Ages. Imagine Books and Records host a great night of live music with a very special release of a project we've kept under wraps for almost an entire year! Join us Friday, June 22nd at 8pm. $5 Cover All Ages.